Please consider sharing these with your youth minister, youth group, CCD classes, school, young adult group, homeschooling ministry and others. 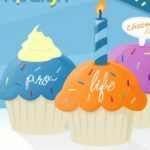 Cupcakes for Life encourages groups to bring in a tray of cupcakes (decorated “for life” if you’d like) for any group of people (a CCD or school class, youth group, parishioners after Mass, RCIA class, etc) to begin a discussion. These cupcakes represent the 53 million children who never had a birthday due to abortion. Cupcakes “soften and sweeten up the conversation.” The idea behind www.CupCakesForlife.com is to spread the terrible truth about the assault on the unborn in a thoughtful, unique, and kind way. Check out Cupcakes for Life. The Truth Booth is simple, scientific, educational, non-confrontational, beautiful, and appropriate for all ages. The Respect Life Office will deliver, set up, and take down. All you need is a safe place, a table, and an electrical outlet. 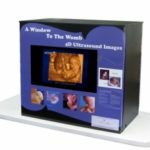 The 3 minute video clip of sonogram images runs continuously (and has a timer to turn off in the evening and back on in the morning). Please contact life@archbalt.org or johanna.coughlin@archbalt.org to borrow this amazing educational tool for your parish (for a ministry fair, special event, or just in the parish narthex) or school (outside the main office, in the cafeteria, library, hallway, etc.). Check out Truth Booth for more information and pictures from the parishes, community events, and schools it has already visited. gather to pray at the Mass and Youth Rally and then join hundreds of thousands to march peacefully to the Supreme Court in the March for Life. One local school brings 7 buses! Check out March for Life. In early March, thousands join together in Annapolis for Mass with Archbishop Edwin F. O’Brien, march to the state capitol, and then gather for a mixer at St. Mary’s. Consider carpooling or bringing a bus of students for this inspiring evening event. 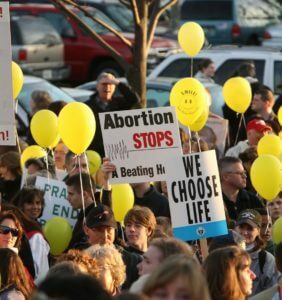 Check out Maryland March for Life . 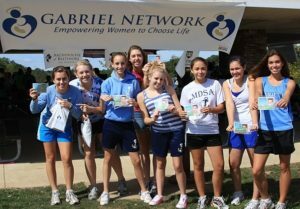 Each September the Gabriel Network has a 5K Walk/Run for Life in partnership with Fannie Mae Help the Homeless Program to support its maternity homes around Maryland. Consider this alternative to the Race for the Cure, which has ties to Planned Parenthood and embryonic stem cell research, and support local pregnant women facing homelessness. In 2010, over 200 people of all ages, including groups from Mount de Sales and Mount St. Joe’s (check out the pictures), joined the race for a fun day on the course. Registration for those under 25 is only $15 (though sponsorships are encouraged). Check out Gabriel Network. This year’s 5K is Sept. 17th, 2011. The Wash for Life is an annual pro-life youth event. On the same day, groups of youth all over the country hold a car wash in their own home town and donate the money to a local Pregnancy Care Center. This way, they participate in a national event while at the same time helping their own community. If your youth group or parish group cannot participate on the day (in 2011, it is September 17th), consider a car wash for life any day of the year. Holy Family (Middletown) and St. Stephen (Bradshaw) have participated in Wash for Life. For information about our local pregnancy centers, check out Compassion Revealed here. Also check out Wash for Life. Your youth group or CCD class pledges to pray for an unborn child in danger of abortion and his or her parents for 9 months of pregnancy, to “spiritually adopt” him or her. Throughout the 9 months, scientifically-accurate, beautifully drawn, and appropriate for all ages, Little One posters (like this one) can be posted in a hallway, cafeteria, or other location to educate students and youth about fetal development. Many participants choose to name their spiritually adopted child. Some schools and parishes post cards with their spiritually adopted babies’ names near the posters. At the end of the 9 months, a baby shower can be held to collect diapers and other materials to donate to a local pregnancy center. For more information and resources, click here. Another resource for use in a classroom (lesson plans, websites, etc) is Building a Culture of Life with Middle and High School Students, available here. If you would like more information, ideas, or resources for working with youth on life issues, please contact the Respect Life Office at life@archbalt.org or (410) 547-5537.